Rangemaster cookers are the ultimate cooking machines. 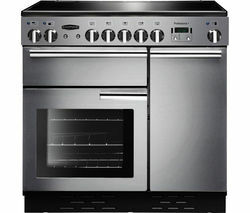 From modern compact versions to the traditional multi-oven models, a rangemaster cooker looks great in every type of kitchen. 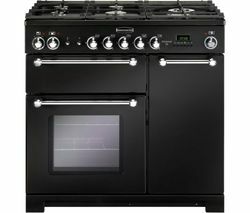 If you frequently cook for dinner parties or a large family, or simply love your cooking, one of the ‘professional’ Rangemaster cooker models will suit your needs. With up to 6 hobs and a standard energy rating of A on every professional model, you’ll feel like a pro chef in the comfort of your own home. You can opt for one large oven or two smaller ones, and these professional Rangemaster cookers also comes in a variety of colours to match your kitchen’s design. For a more traditional look you can opt for one of the Classic range, with catalytic liners and timeless style. If you’re looking for a large model but working on a tighter budget, the Country Range from Belling Cookers gives you a luxurious 7 hob system, two separate ovens and a grill to boot all for under £800. Our Hotpoint Cookers also offer great value for money and pack lots of technology into their typically compact sizes, with gas and electric options as well as sophisticated cooking settings.